This week saw a fascinating story of a Maryland man pulled over in a Lamborghini dressed like Batman. Since Bruce Wayne in the Christopher Nolan movies drives a Lambo, the story got a lot of social network traction, a few discussing the story but most using it as a jumping off point to refer back to The Dark Knight and hopes for The Dark Knight Rises. 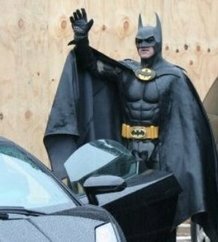 After the news broke that police in Montgomery County, Md., last week stopped Batman for not having the correct plates on his Batmobile, many naturally wanted to know more about the man behind that mask. The Washington Post today profiles the mysterious Caped Crusader, and it turns out that he does seem to be something of a real life hero to sick children around Washington, D.C.
Maryland’s Batman Looks Like A Real Hero : The Two-Way : NPR.